Another character who is an Influential Lady of Science Fiction is one I would willingly serve under. I am talking about none other than Star Trek Voyager’s Captain Kathryn Janeway. I will be honest, when I first saw this captain, I was impressed. And as the seasons ticked by, I fell in love with this woman. Portrayed by the talented Kate Mulgrew, and Captain of a ship tossed 75 years away from Earth, Janeway showed us that a woman can be the captain without trying to be everyone’s friend. She also showed us that women can be as no-nonsense in a leadership role as a man. My favorite episodes which show the true depth of this character are “The Year Of Hell: Part 1 and Part 2”. In these episodes, we see a race of beings intent on eradicating timelines and species to correct their own. In the process, they take the crew of the Voyager through an entire year of hell which culminates in…well, spoilers. Just watch it on Netflix and you’ll see what happens. Needless to say, Janeway continues to push forward and step up until the bitter end. She doesn’t let the aliens win and puts up a fight to beat all fights. During the Star Trek The Next Generation series, we did get a glimpse of a few women, Beverly Crusher comes to mind, as ship captains. 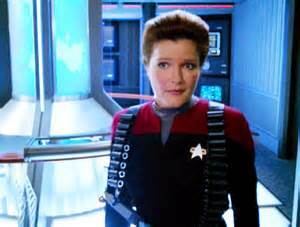 However, until Janeway, we hadn’t had a female captain in battle situations as serious as with Janeway and her intrepid crew. Kate Mulgrew gave us a character which showed women that we can also pursue military careers and don’t have to worry about the ceiling. The great thing is that, in this case, art was imitating life. We have women as captains of ships in the Navy, however, they hadn’t caught up on television as much until Janeway. I consider Kate Mulgrew an Influential Lady of Science Fiction because she brought us a character that gave rise to the truth that women can lead in the military as well as men. How many girls saw this show and decided to pursue a career in the military with the decision to become captains of destroyers and carriers, I wonder? Admiral Kathryn Janeway: As they say in the Temporal Mechanics Department: there’s no time like the present.